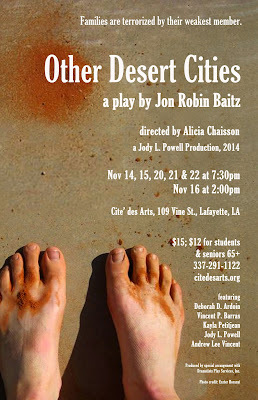 Rehearsals for “Other Desert Cities” are underway at Cite’ des Arts in preparation for the show’s opening on Thursday, November 14. This two-act blend of comedy and drama written by Jon Robin Baitz revolves around family secrets and the lengths to which parents will go to protect their children. The play is set on Christmas Eve, 2004. Brooke Wyeth, a writer, returns home to Palm Springs for the first time in six years. Before the festivities begin, she announces that her new book is actually a memoir that reveals their deep family secret. The story explores the divide between East and West coast, left and right wing, and Generation X and the Greatest Generation. It exposes the difference between knowledge and power. Ignorance isn’t always bliss. This Jody L. Powell production is directed by Alicia Chaisson, and features a cast of veteran actors. The head of the Wyeth family is Lyman, a former Hollywood actor, GOP chair, and Ambassador. He is played by Vincent P. Barras, whose prolific work has been seen across Acadiana in “Tuesdays With Morrie”, “Urinetown”, “A Nice Family Gathering”, and “Fragile Thing Cracks”, among many others in theatres stretching from New Iberia to Lafayette to Eunice. Jody L. Powell plays his wife, Polly, a former screenwriter, dear friend of Nancy Reagan, and woman who doesn’t back down. Powell brings to the stage a list of acting credits that include roles in “On Golden Pond”, “The Subject Was Roses”, and “The Last Night of Ballyhoo” at Eunice Players’ Theatre, where she also recently directed “The Diary of Anne Frank”. Brooke is their liberal daughter who has escaped to the East coast where she works out a meager living as a writer and recovering from depression. This character is aptly played by Kayla Petitjean who has owned roles in “Urinetown” in Lafayette and “Blithe Spirit” and “Move Over Mrs. Markham” in Abbeville. Andrew Lee Vincent, Artistic Director of the Tea Sippers’ Theatre Company in Lafayette, plays the role of Trip, Brooke’s younger brother who stayed in California and is the producer of a reality courtroom TV show. Andrew’s directing and acting experience in plays including “The Rocky Horror Show”, “Visiting Mr. Green”, “Into the Woods”, and “RENT” allows him to bring freshness and lightness to the story. Deborah D. Ardoin plays Silda Grauman, Polly’s sister and former writing partner, who is now a recovering alcoholic. Ardoin’s considerable talent has been seen in “Fragile Thing Cracks”, “In the Bones” and “Buried Child” in Lafayette, and “Who’s Afraid of Virginia Woolf?” and “The Glass Mendacity” in Eunice. She also recently directed “The Survivalists” and co-directed “Barrier Island” for Acadiana Repertory Theatre in Lafayette. Alicia Chaisson is the director of this intriguing play. She brings experience from her work with the New York Neo-Futurists, directing shows such as “Urinetown” and “William and Judith” in Lafayette, and, most recently, acting as Creative Consultant for the ULL original mainstage show “Manual Not Included”. Evening performances will be held November 14, 15, 20, 21, 22 at 7:30 p.m. A matinee will be held Sunday, November 16 at 2:00 p.m. Tickets are $15, with a discounted price of $12 for students with ID and seniors 65 and over. Tickets can be purchased at citedesarts.org or by calling 337-291-1122. The theatre is located at 109 Vine St. in Lafayette.